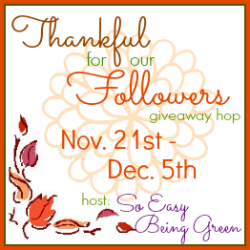 Welcome to the Thankful for our Followers Giveaway Hop hosted by So Easy Being Green. YOU are the reason that we host giveaways so it's time to show our appreciation to you... our readers and blog followers. Normally we offer giveaways with entries to help boost our blog, but this Hop is all about making it easier on YOU. Each blogger in this Hop is offering a wonderful prize, worth at least $25 and ALL giveaways have only ONE way to enter! Hop around to them all as we show you how we're Thankful for YOU! Everyone loves getting goodies in the mail right? Mail a Monkey is the perfect place to go for this type of gift. They have stuffed animals that they stick in a tube and you can include a personalized letter and then send it to the right recipient. It never needs to even touch your hands which is a nice way to get a gift to someone in a timely manner. We received the Joe Monkey and he's so adorable! It was personalized to my son. I didn't want anything too special in there. Emerson can't read and I plan on giving Joe to him for Christmas! But it's such a nice gesture and I love the personalization factor! Mail a Monkey has 15 stuffed animals to choose from and they're all really cute! I like the Personal touch on these. And who doesn't love stuffed animals? These are great for a kids birthday gift, but also for an elderly person as a get well gift or a just because gift. Everyone loves stuff animals! The tube is also great to reuse. It's perfect for pens/pencils or smaller knick knacks. It's a great big size and you can hold just about anything in there that you want/need too. Price: Each one is $39. I think this is reasonable! Overall: ***** Such a cute idea! So Easy Being Green, the Blogging Mamas Network, and the Thankful for our Followers participating bloggers are not responsible for sponsors who do not fulfill prize obligations.